Yes, crocheting really is that important. In case you don’t quite understand why, I’ll start at the beginning. Two women in LA, Margaret Wertheim and her twin sister, were concerned about climate change. If left to continue along its current trajectory, the world’s climate will heat up (even more than it has for the past decades). This climate change promises to bring a number of disasters upon the human race and our planet. One of the potential disasters that climate change could cause is the loss of many of the world’s coral reefs. The total area of the world’s coral reefs comprises less than .25% of the ocean, yet one fourth of all marine life (about 2 million species) live in, on, and around reefs. Even slight changes in ocean temperature can kill reefs. It is estimated that many of the world’s reefs will be destroyed or significantly damaged in the next 20 years. General estimates approximate that 10% of the coral reefs around the world are already dead. When coral reefs die, the species that live on them are threatened. Loss of biodiversity at this scale is not only tragic, but could have significant impacts on humans. The sisters found this particular disaster very troubling. This is where the story gets less tragic and a lot more inspiring. 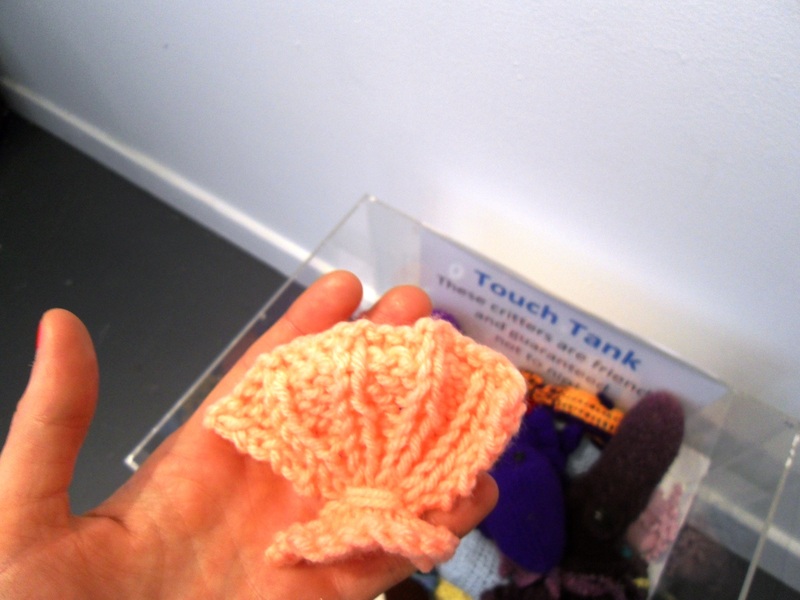 The twins started crocheting corals. They used a crocheting technique invented by mathematicians in 1997 to model hyperbolic shapes called hyperbolic crocheting. It has nothing to do with gross exaggeration. This ended up being a perfect technique for producing coral reproductions. 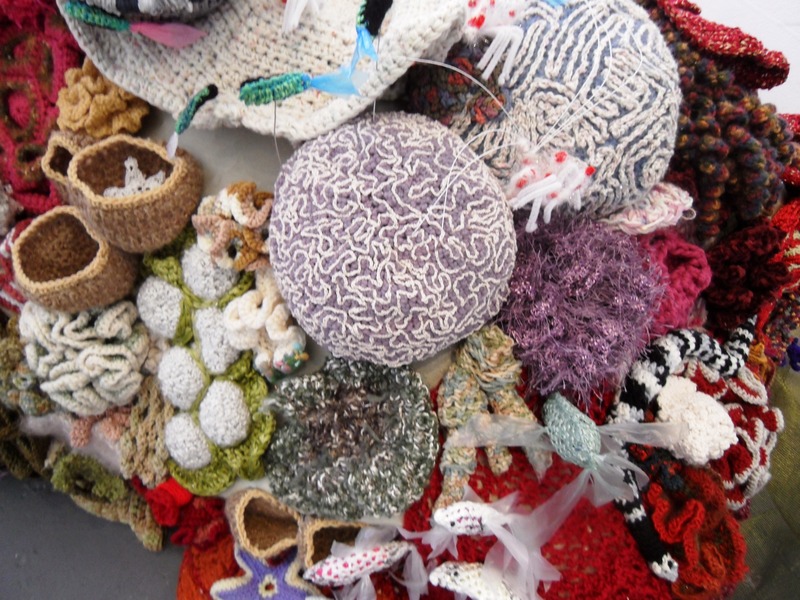 They crocheted a lot of corals, then they did something to change the world. They shared their corals with art museums. They got a community in Chicago to crochet with them. 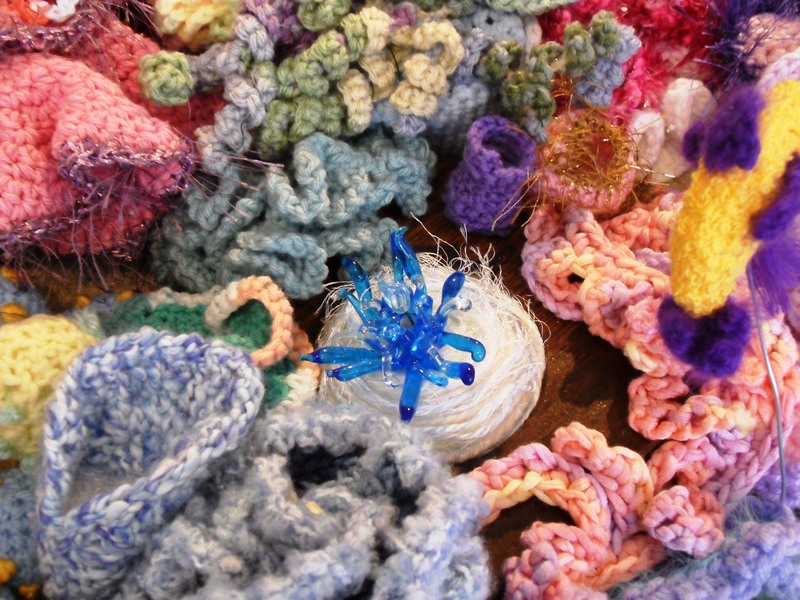 Then the crafting became a movement and groups all over the world started to crochet corals. Margaret Wertheim talks about the project at a TED talk, “The beautiful math of coral (and crochet)”. She explains the project beautifully. 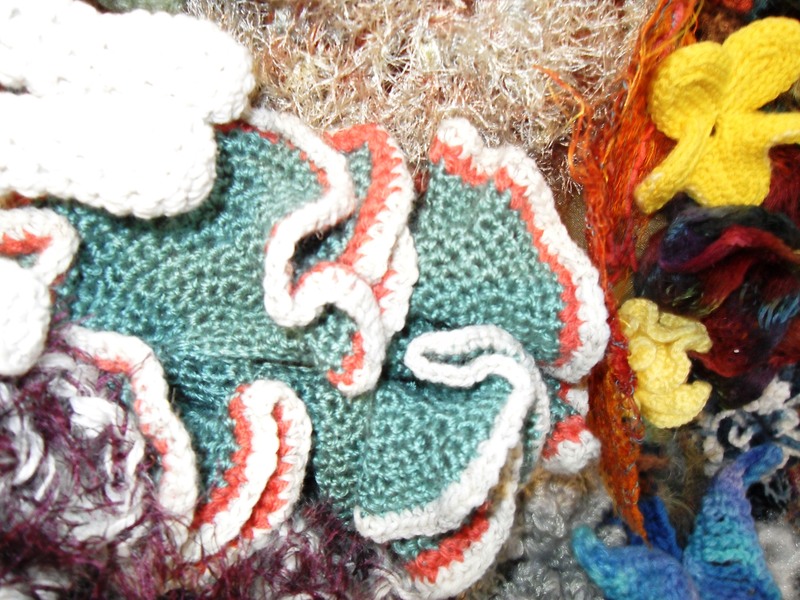 In Saint Petersburg, Florida, a city of about 250,000 people which is deeply connected to the ocean, 300 people crocheted corals. The pieces were collected in a gallery and on the opening day 600 visitors came to see the reefs that were constructed from their handiwork. The project in Saint Petersburg was a melding of math and art and science and community. 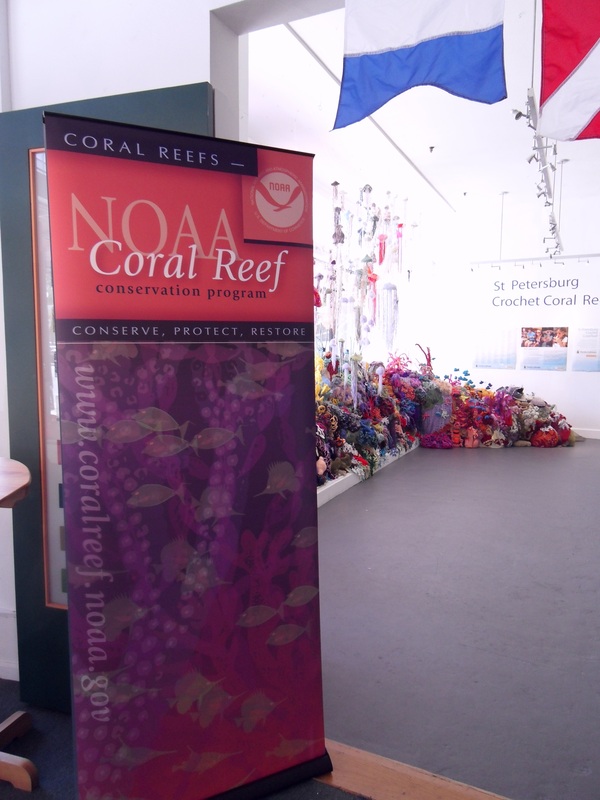 Workshops were held all over the city for people to come learn about crocheting, corals, and the problems affecting coral reefs. All ages and genders contributed their corals. Some created the fish, invertebrates, and other creatures that depend on coral reefs. 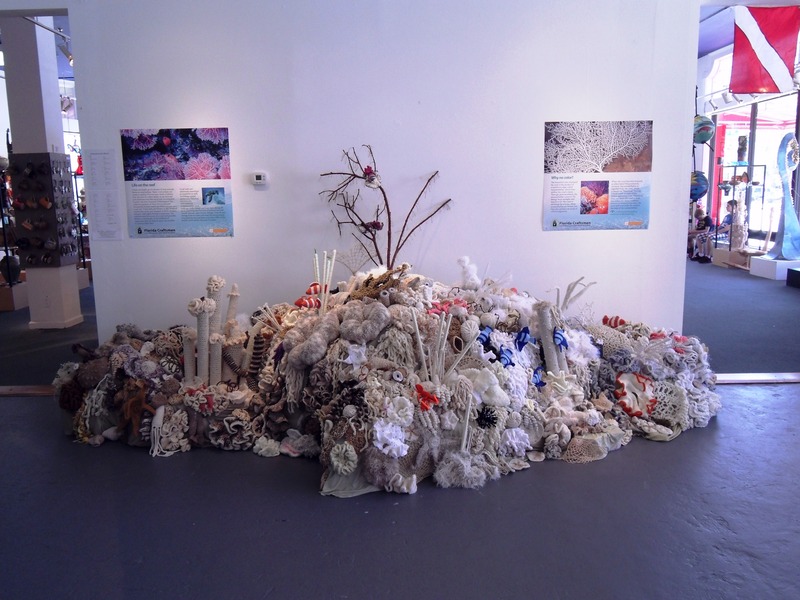 The gallery featured a bleached coral, showing what a reef decimated by hot ocean waters looks like. Other threats to corals besides climate change were also addressed. The Deepwater Horizon spill killed corals in the Gulf of Mexico and inspired a blackened reef at the exhibit. Reefs are also threatened by water pollution, careless collection of coral specimens, clouding of water by construction or mining projects, and even introduction of an invasive species, like the lion fish in Florida, to an area. The project has yet to save the world’s corals, but crocheting might be the first step that leads to the protection of this precious resource. This entry was posted in Biology, DIY, Fun, Funny?, Geekism, Science and tagged Arts and Crafts, Biology, Climate Change, Coral Bleaching, Coral Reef, Crochet Coral Reef, DIY, Exhibit, Museum, Oil Spill, Science. Bookmark the permalink. This definitely want me to do more crocheting. It’s incredible, pickledtoo! I’ve seen this in person in St Pete,FL and it is stunning!!!!! If you get a chance to see it I recommend it. This is beautiful! A friend of mine makes wonderful crochet characters from various universes – Batman, Pokémon, Disney et cetera – but seeing so many creations together is simply incredible. Every day I am more amazed at the marvels that can be created from a ball of yarn and a couple of hooks. I also love your philosophy in the top-right corner – it makes me feel better about blogging when I sh/could be doing uni coursework! What a really wonderful idea. I am a fiber artist too! We depict petroglyphs and I make many things from fabric, fiber and beads. Keep up the wonderful work. THIS is amazing and beautiful and wonderful and lovely. + I have just been to the seaside so I feel particularly inspired for the fishes (and corals but unfortunately there is only the slimy brown seaweed as a Cornish equivalent, which I feel average about). Learning about the world can be done through a variety of ways – movies, articles, and even art! Check out this interesting post on how two women have been using the craft of crocheting to make a difference in the world of understanding! Ugly Sweaters No More… Interesting way to educate about the importance of biodiversity and climate change. Maybe school science fairs could look more like this? Haciendo calceta por el planeta! genial! I like the uniqueness of this idea! Great post. So nice, thanks. I’ve re-blogged on ‘pet rock and half pant’. Reblogged this on pet rock & half pant. Excellent post, incredible idea, splendid work! I would very much like to share it on my WordPress blog, if you could add the option? Or I will ping it back if you prefer. Congratulations, really! Ganchillo y media para salvar al planeta, una original manera de concienciar sobre el cambio climático. These are amazing! Congrats on the beautiful work! It is too wonderful a story and a very inspiring work too ! I shall follow it up with my crochet work ! I love it tremendously. I crochet. How can I help? This is so super cool makes me want to pick up my needles again! Great work! I shared this with our facebook followers, really interesting and a work of art too. This is wonderful, so inspiring. The melding of the art and science is so powerful. Thank you for sharing this project. Gorgeous! Esp. the jelly fish! Graceful crocheting world! Thank you for sharing the moment changing the world. These are incredible. May I use them on my own blog The Purple Sweater? it’s a site for knitting and other needle arts and I’d love to be able to put it to some good use to raise awareness about what is happening to the seas. You can see my blog http://www.thepurplesweater.com it’s a wordpress site too..all of mine are. Look for me as Suzysomething.wordpress.com so you can get to know that I’m just a harmless little old lady who has the heart of an activist. I posted the story and pix this evening and included a link to your blog (I think..my computer seems possessed by gremlins today and I’m not sure what it has actually done and what I think it has actually done!). Thanks for your generosity in letting me share this on my blog. Wow, just amazing. I am a knitter and know how much work this takes. Great work. Amazing, touching, and inspiring. Thank you! 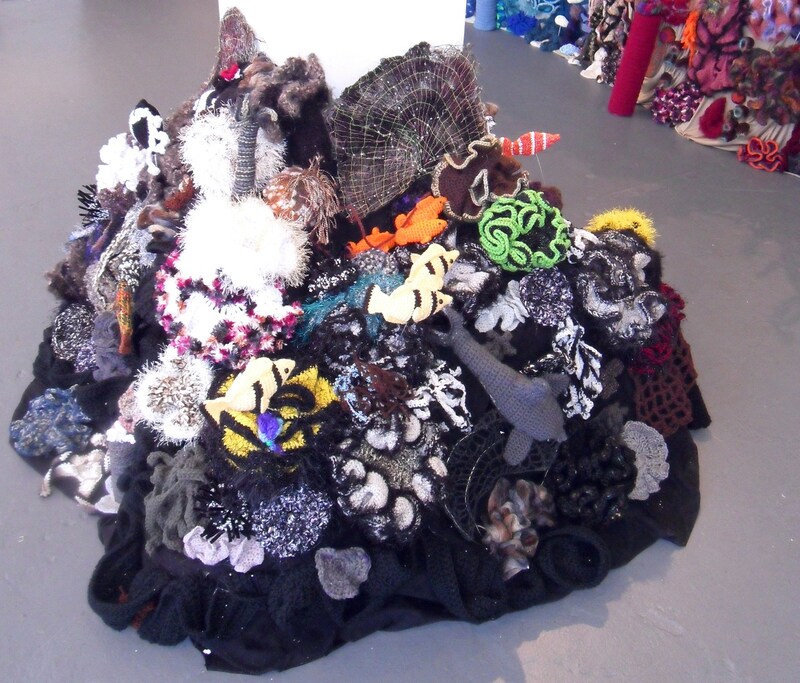 We have been following the “Crochet Coral Reef” work for quite a while, always amazed at its beauty and significance. Congrats! Could we reproduce your post in our recently established BLOG? Please contact us, and best of luck! Great post. Thank you for sharing this wonderful project. I just tweeted it. These are all beautiful. I do crochet but not anything like this. A credit to you all. Another reason why Everyday is Earth Day ! 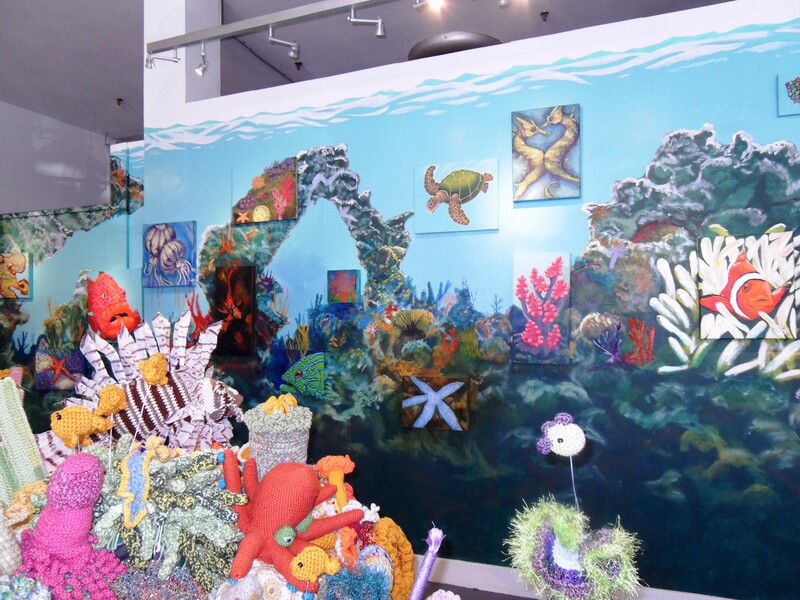 This amazing crocheted art project brings attention to the loss of corals on our Great Barrier Reef, as well as reefs world wide. The state of marine biology is important world wide as we learn to take care of our planet! This is a wonderful project , very educational to me. Appreciate the art and the meaningful component of the project. No wonder…you deserve the best of the best in freshly pressed in July 2012. Congrats! Thanks for sharing. Thank you so much for this. It’s really cool to see people take their passions and skills and just using them. I’m a knitter, hoping to do my next project in crochet. This makes much more sense than yarn bombing! Great post and photos. Congrats on FP. Gorgeous! I’m writing an MA thesis on marine biodiversity conservation at the moment and can’t believe I hadn’t heard of this project. I’m truly amazed with the ingenuity. What a great project! The crocheted corals look amazing! Terrific!!! It’s a great cause and fabulous work of everyone !!! What a wonderful project! Such glorious work! Great Project, amazing Creative works and beautiful blog. I love to snorkel and have done a little scuba in Hawaii and California. I understand that the end of the coral reefs is the beginning of the end of our planet. When are Nations, Corporations, and people…going to learn, that we can not have it all. I am guilty too! Incredibly beautiful and creative! So wonderful! This is beyond amazing. I am a scuba diver, and I am deeply concerned about the long term damage that climate change (and human wrecklessness) have on our reefs. Thank you for sharing a beautiful and inspiring project. Congrats on FP! Reblogged this on Linny J Creations. I love when art becomes a cause, an inspiration for change. Thank you for sharing this story, it is wonderfully fascinating! I have crocheted since I was 12 and never have I seen this kind of application.This is wonderful! What an amazing use of a old fashioned craft. Thanks for sharing! Really enjoyed it. Hyperbolic Crochet! That makes me smile. Thank you so much for sharing such an incredible and interesting story. It is amazing what passionate people can do. 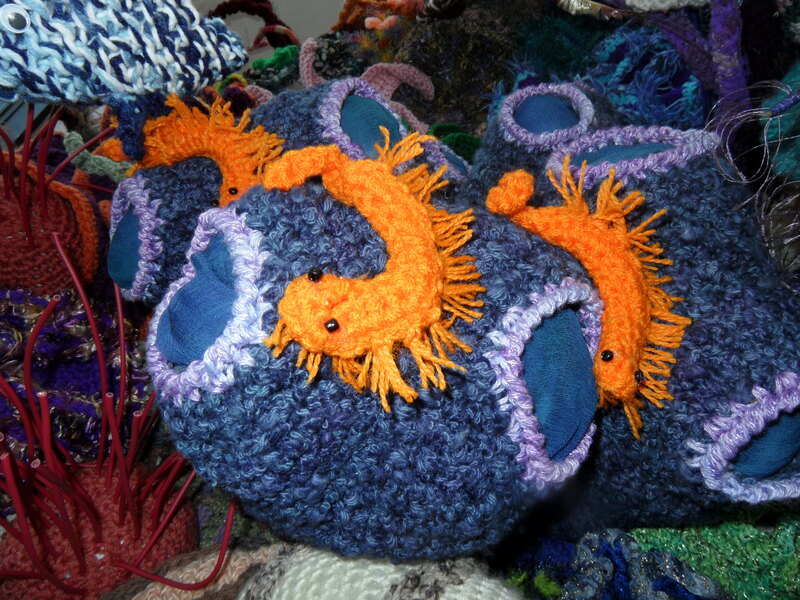 Seriously – Hyperbolic Crocheting! Check out the link. Those crazy Cornell- ians! Never thought I’d say this, but this crochet is badass! So do the sisters just raise awareness? Or do they raise money for conservation or restoration (is that possible?) of coral? Very cool. That is phenomenal! Both the crocheting and the attention it is bringing to a huge world issue. I’ve been crocheting since I was teenager and this far surpasses anything I could ever do! Absolutely stunning! This is totally over the top crocheting, I am not good at it at all, maybe some knitting in my bag of tricks. This is conscious crocheting, and beautiful for the planet. You continue the great job you’re doing. Cheers! Great post! I plan on reposting it this Sunday on my blog Marti Ink in the Week’s Head-turning Headlines section under “Creativity.” Congrats on being Pressed! Amazing! It takes crocheting to a whole new level!! Beautiful work, and congrats on being Freshly Pressed!!!! Hats off to the effort and the message. très beau travail! jolie création! magnifique intention! je suis admirative! vraiment grandiose! Nice pics & details! Gave you guys (and your hedgie, though I’d go for tonic rather than martini and I’d imbibe rather than tote) a shout in own cuddly science entry (April 2012). Stunning work. As an avid crocheter I am extremely impressed by the handiwork itself. Thank you for sharing this artistry. God bless. it’s amazing! I was like diving into the sea!! Wow! So beautiful in so many ways for so many reasons!! I shared this w/ my 11-yr old daughter. Fantastic! What a wonderful project. I had no idea–thanks for sharing this with the blogosphere. And congrats on FP! I am in awe of all the work done here. I crochet myself but have never done anything like this! it’s so creative! Beautiful mingling of beauty and sustainability. Creativety meets practicality! That is the most unique way I’ve ever seen crochet utilized, absolutely beautiful!! You’re doing great work. Keep it up. great idea,i wish you well! Amazing. I’m a knitter. Are there any patterns for knitters? And I am sure you could use these as a starting point and get creative. What a great post!! 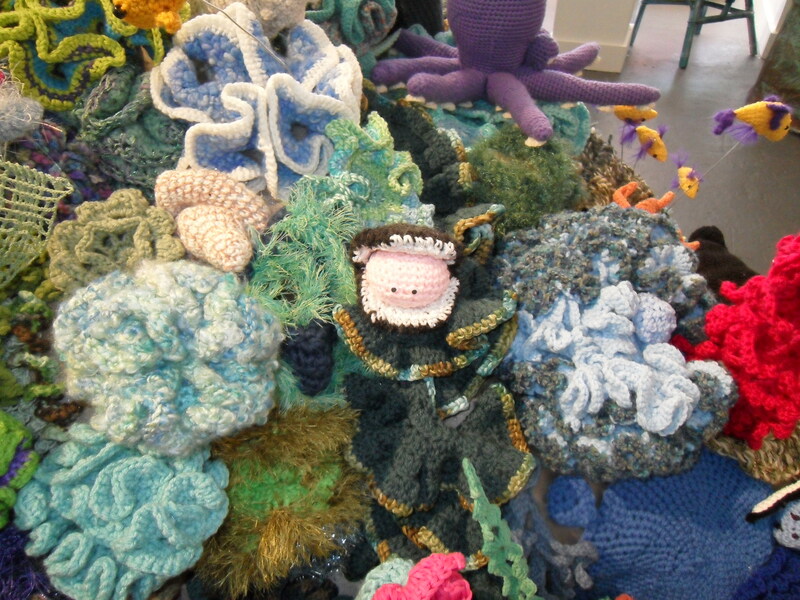 I might start crocheting coral reefs myself! Thanks for sharing! Hooking to save the planet!!! As an artist who started out as a marine biology major, I love this effort! Wish I had the time to commit to a project like this. What a great way to spread awareness on an important topic! I wish the coastal community I live in had something like this. 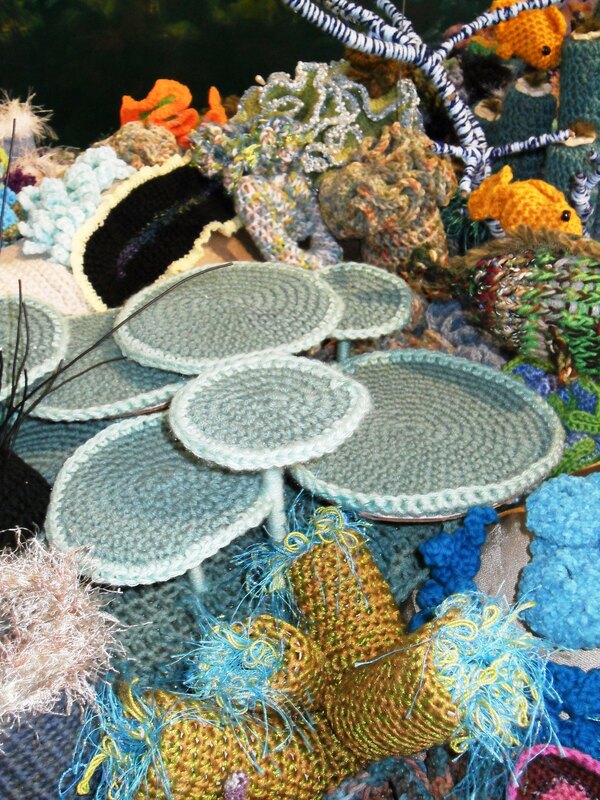 I would so get involved, as I am a crocheter and sea life enthusiast. Great post! This is breathtaking! Is there any way knitters can get involved? WOW, what an amazing effort – a beautiful way to show the things that we could lose so easily. Things in this blog post: Science, fiber arts, and awesome women on a blog called Pickled Hedgehog Dilemma. Plus I’ve developed Heat Exhaustion (you mean seeing an outdoor play in 100+ degree weather is not a good idea when one’s medication makes one prone to dizziness? Do tell…) so this may be the most coherent thought I produce for a while. Lovely post. Now they should send some of their work to underprivileged kids to cuddle. We love your article. We would like to post it in the next few weeks. Please contact us. Such beautiful work…love the medium and the message! Twin sisters, one an art prof and one a science writer. The world needs more of those! What a wonderful concept. I’ve shared this with my wild swimming friends…. thank you for such an inspirational blog! I adore her quote, “There is a direct line between feminine handicraft, Euclid, and general relativity.” What an inspiring initiative! This is a great post…I hope it’s OK that I re-posted the URL for this post to our blog: http://www.FiberCollege.wordpress.com…I gave you full credit and hope that our post will send more people to your blog! Fascinating project and an incredible TED talk. Thanks for bringing this to us and for being Freshly Pressed. This is really amazing! Well done. What a fantastic blog, really inspiring and hopefully will help people to connect to and understand their planet. The crochet is amazing, what a wonderful use of the craft. Nice post – I took part in this when it came to the Royal Festival Hall in London a couple of years ago. So much fun and cool to see people using old plastic bags instead of wool to create our reef. Loved this,I can’t imagine how long this took,did more than one person do it?I learned to crochet at my grandma’s knee and still pick up a hook once in a while.I can be very theraputic.Thank you for the amazing pics,I loved it. I love science! I love the environment! I love to crochet! My goodness what a beautiful combination! Science, coral reefs and needlecraft – three of my favorite things in one post. A-MAZING! Thanks for sharing! Three of my favourite things in one post – needlecraft, science and coral reefs. A-MAZING! Such a cool way to raise awareness and make steps toward saving our reefs. This work is amazing. What a great way to get people to think about coral reefs! I’ve just been to Niue in the South Pacific where there is still beautiful unspoilt coral, and I hope that it will remain that way. I just wrote a short article about your post Crocheting to Change the Planet, referring to your article: Euklid, Häckeln und allgemeine Relativitätstheorie. There is a photo of your post in it, I hope you don’t mind. 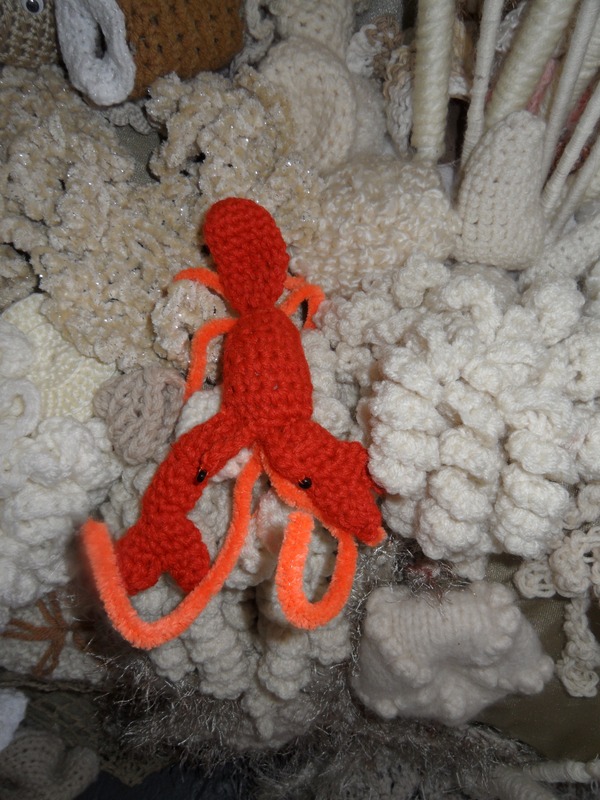 Awesome blog about crocheting, climate change and coral reefs. I find very interesting your article!!! Congrats!!! Very awesome post. I am in Australia right now researching algae. 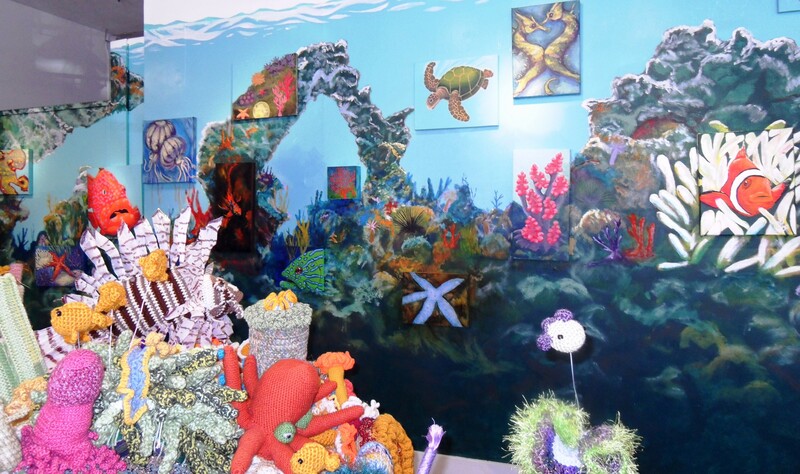 I visited the largest great barrier reef aquarium last week and the crocheted version looked remarkably similar. Great post, and good luck with grad school in the near future. I feel a great sense of science educator solidarity. What an amazing idea, and the product is beautiful. The cause is excellent…I didn’t realize that so many coral reefs were being destroyed or that so many species lived in them. (I guess it’s been a couple years since I took biology). Congrats on Freshly Pressed! Wow. This is truly amazing. As an avid crocheter and environmentalist, I am deeply touched by both the creative genius and philanthropic vision of these women’s work. Thank you so much for sharing! Amazing! Loved the work. I am glad to hear that people are working hard towards changing the planet! Saving the planet from danger. Loved the post! Congrats on being Freshly Pressed! 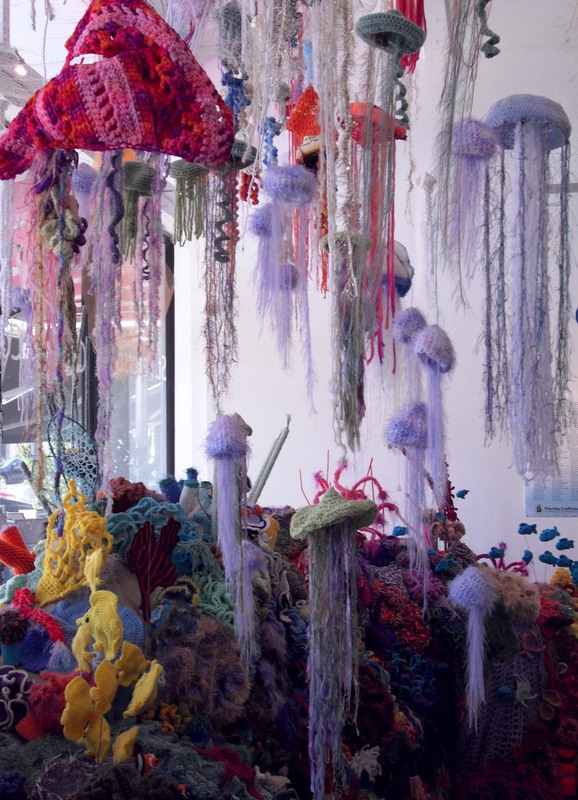 Wow the crocheted jellyfish are really something! Wow those are awesome! I can barely crochet a beanie or a pot holder. Simply amazing! These creations by crocheting is beautiful. Can easily relate this to the young children on preservation of the ocean especially the marine life. Great for show & tell session in school. These pieces are amazing! How much time did the more complex ones take? Phew! I never knew that Crocheting was an art, but the above pix proved me wrong. I’ve always wanted to learn but never had the time. I just discovered Margaret Wertheim a few weeks ago when I read her book “Pythagoras’s Trousers: God, Physics & the Gender Wars” — great stuff! Delighted to learn of this new (to me) initiative. So glad you’ve been FP so I can get to hear about it! This is beautiful! Seeing the picture in the miniature form I actually though it was real coral reef. Thanks for sharing this work! Seeing it in person was AMAZING!